To say my mother lived in New York City is a little vague. 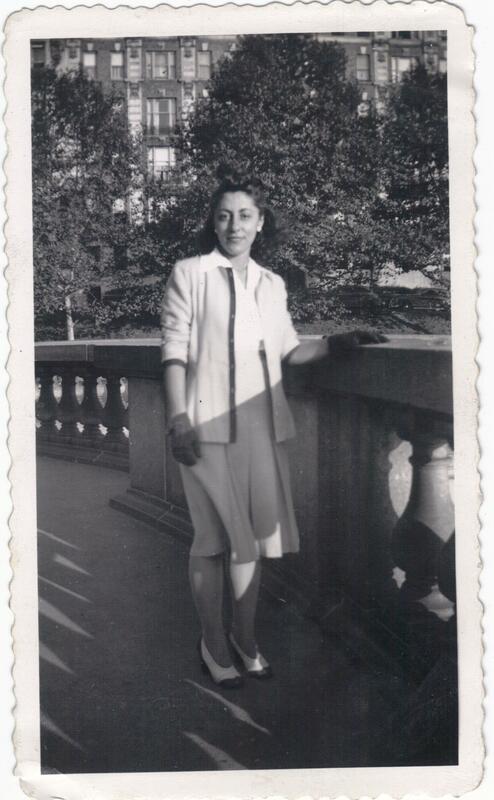 To be more exact she lived in Astoria, Queens during the 1930s, 1940s, and 1950s. Those were great years for her and she loved Astoria. At that time Astoria was predominantly an Italian and German neighborhood. As the daughter of Italian immigrants she fit right in. During the World War II years, austerity and utility were themes that were emphasized in women’s fashions. When I think of the 1940s I think of a severe look with shoulder pads like Joan Crawford wore. But in looking at what my mother wore in the 1940s, I don’t get that same impression. I do see a tailored look, but it’s still soft and pretty with a contemporary knee length hemline. This is a lovely but practical ensemble with a white blouse, high-waisted pleated skirt, and matching jacket with dark trim on the cuffs and down the center. She is wearing dark gloves, a dark bow in her hair, button earrings, and classic spectator pumps. She did a great deal of walking, but still wore high heels as she was obviously interested in being stylish and looking her best. I love this outfit- it’s perfection! 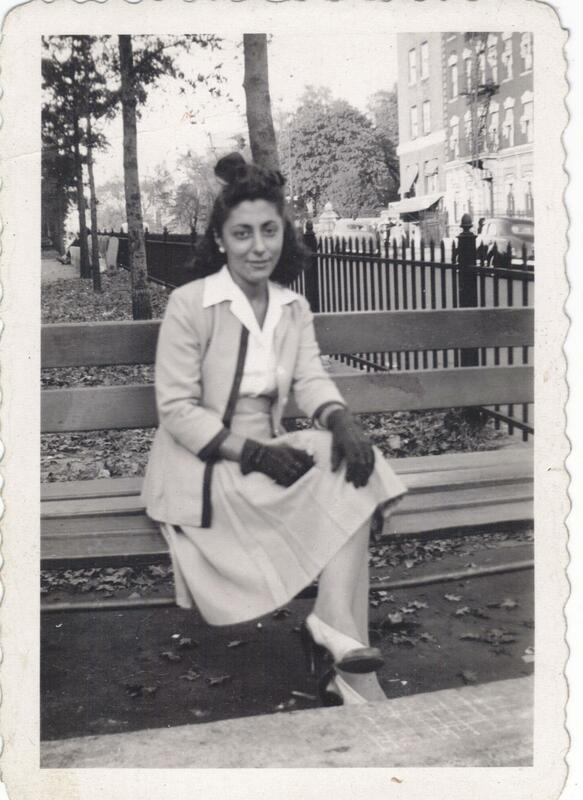 This entry was posted in Vintage Fashion and tagged 1940s women's fashion, 1942 women's 3 piece suit, astoria queens, queens new york on March 14, 2013 by Stitch It Again. 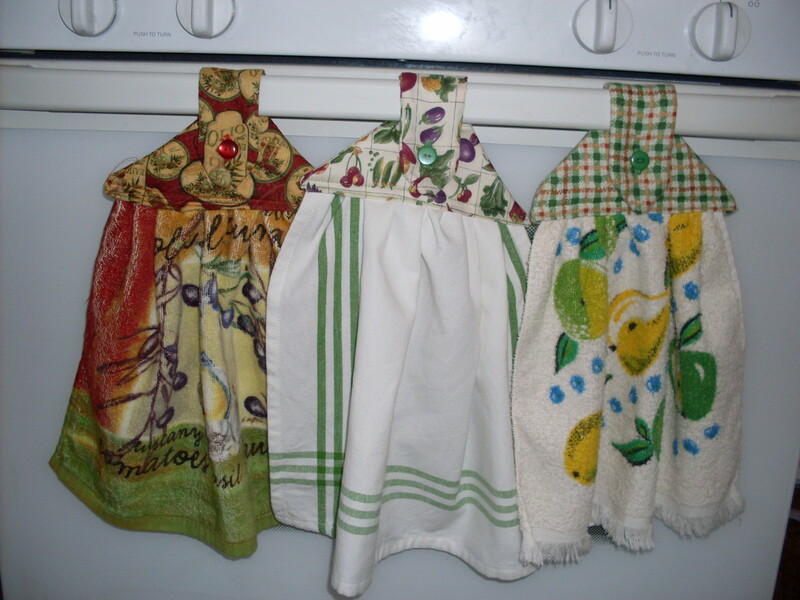 I like hanging towels and I know others who do too. 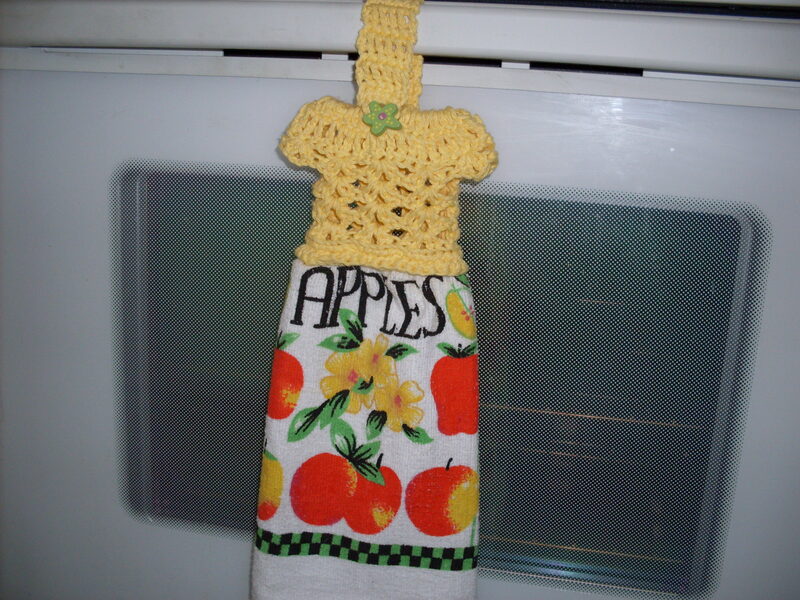 In the past I made a crochet version called the dress towel topper. I got the idea that the little dress towel might be cute to display on an actual doll. 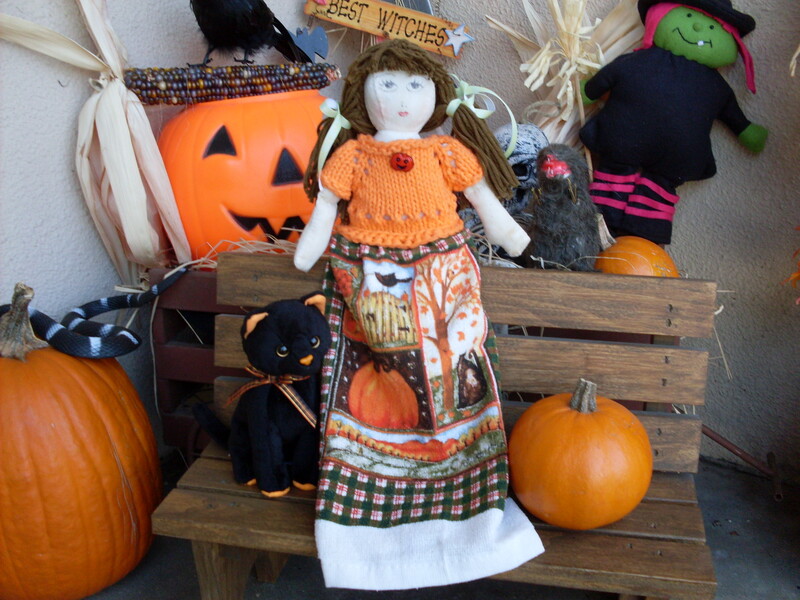 I had one of those 9 inch unstuffed ones they sell in a bag at the craft store, and added the fiberfill, yarn hair, drew a face, and put her in the towel dress with the hanging tab folded down inside the back. I also improvised a knitted version that I knit top down in the round. 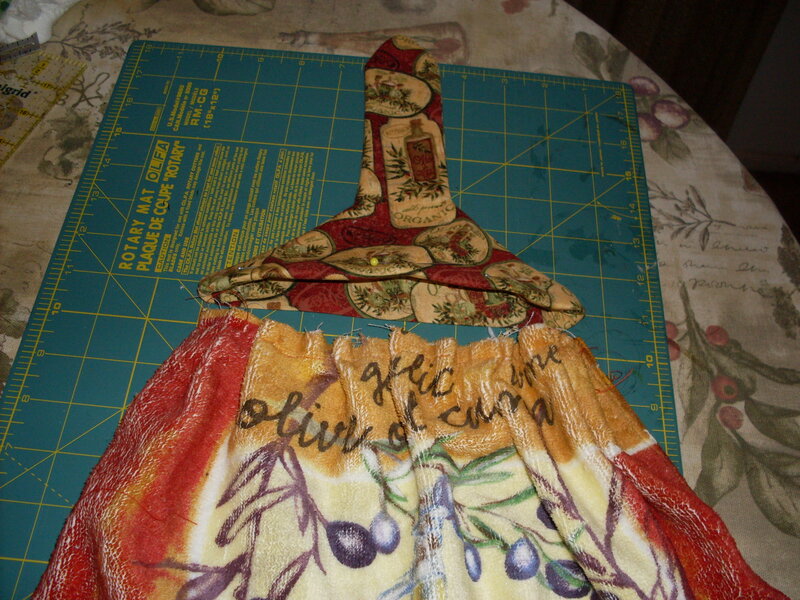 This time I wanted to try a sewn version and I found what I was looking for in this tutorial on Kleio’s Belly’s blog. 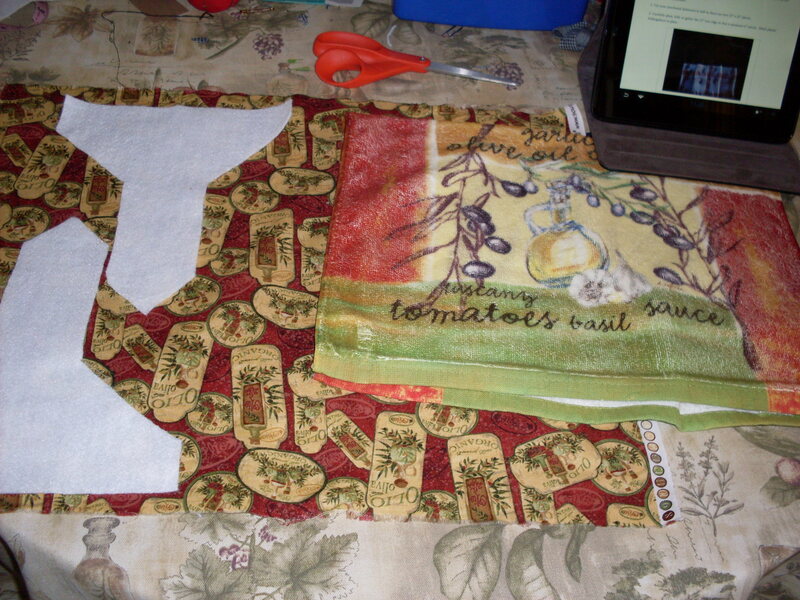 The fun part of making a sewn version is pairing fabric that looks good with the towel. 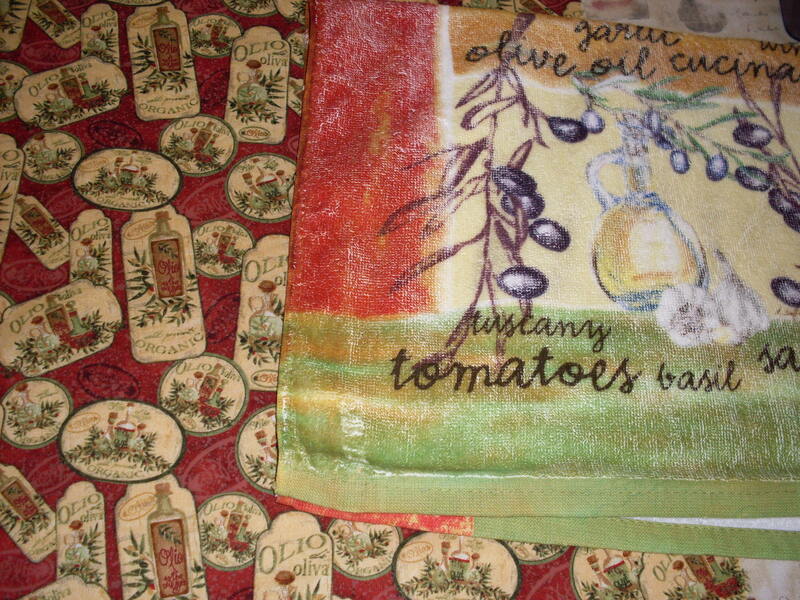 I started with a pear towel matched with a plaid, a woven cotton towel with a fabric called “Country Market” and the tuscany towel which shares the olive oil theme with the fat quarter named “First Course”. 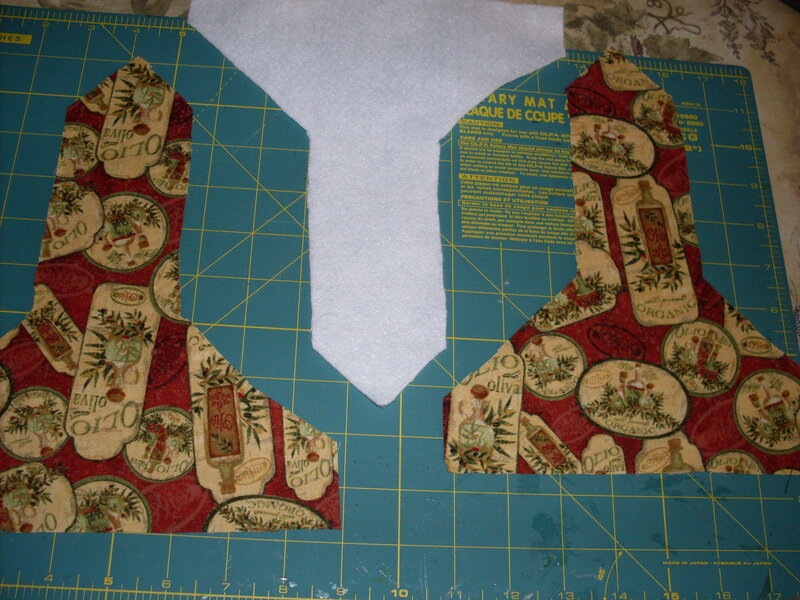 The tutorial calls for flannel to be used for interfacing for the handle. I used Thermolam Plus fleece. I made the base of the handle 2 inches wider so more of the towel can be shown off. I had trouble sewing through the thickness of the handle with the interfacing so another change I made was to cut the fleece 1 inch shorter than the fabric at the bottom so there would be less bulk and to make it easier to hem. I also cut the two sides of the handle in different directions so when the towel is buttoned the underside showing on top is right up. Here the handle is turned and ready for joining. You have to be sure to insert the towel securely and sew 2 rows. Thank you to Mara of Kleio’s Belly for the clear tutorial. I also have someone else to thank: my stepmother, “mom”. When I mentioned to mom I couldn’t figure out how to make buttonholes she made an appointment for me to learn at a sewing machine shop and drove me there when I came to visit in her neighborhood. So I thought it only fitting that I use my new buttonhole skills to make something for her. She likes them! Here is her favorite in use by the sink. 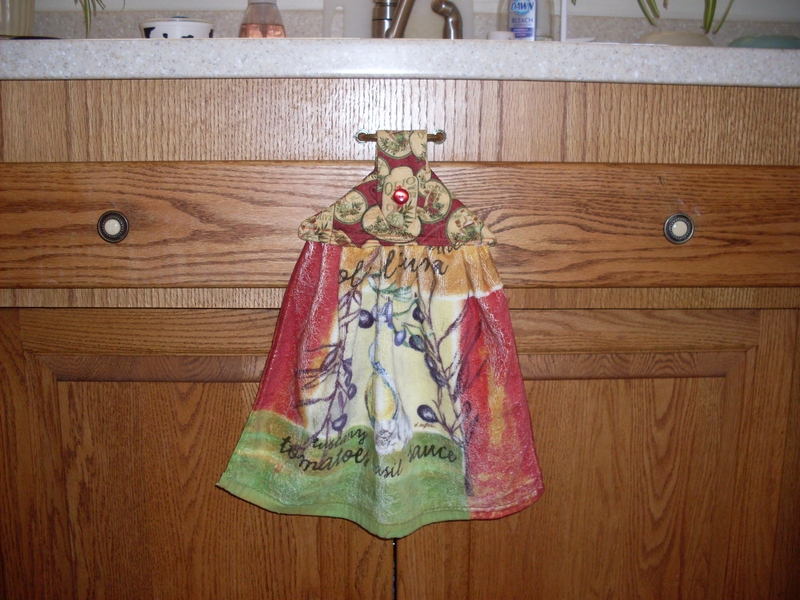 This entry was posted in Sewing and tagged button tab towels, dress towel topper, kitchen towels, towel toppers on March 8, 2013 by Stitch It Again.